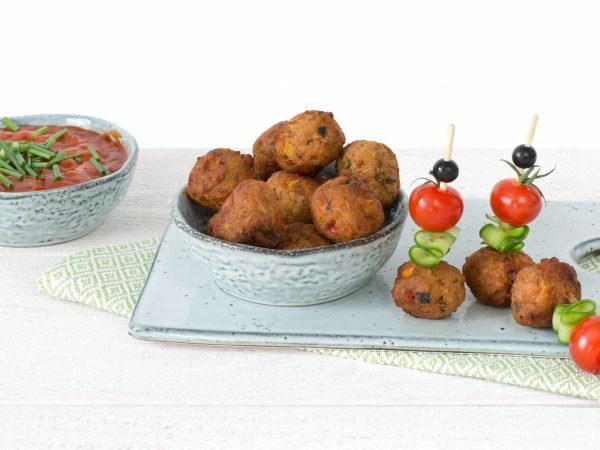 The Vegetable Balls make it very easy to snack healthily. The balls are filled with vegetables and have a spicy taste. Great on a sandwich or as a snack with drinks. Vegetable Balls also fit well with oriental dishes. A vegetarian Vegetable Ball weighs approximately 17 grams. 51% vegetables (carrot, mushroom, corn, courgette, onion, green sweet pepper, red sweet pepper, leek, celery, garlic). water, 14% vegetable protein (soy, wheat gluten), rice, starch (potato, wheat, corn), sunflower oil, egg white*, natural flavouring (celery), milk protein, dextrose, herbs and spices, salt, soybeans, wheat. * free-range eggs. Produced in a facility that processes peanuts and nuts. Frying pan: 3 minutes on moderate heat. Stir every now and then. Oven : 8 min. at 180°C. Turn once. Microwave : 1 min. on 900W. Barbecue or grill : Rub with (olive) oil. Grill 4 min.